Alberto’s story is notorious at Arsenal purely for the obscurity of his origins. 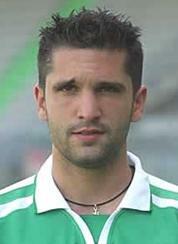 In 1997 he was a 22 year old business administration student playing in the German fifth tier for SC Feucht. Wenger with his contacts in Alsace and western Germany, watched him play only once against ESC Rangierbahnhof Nurnberg along with 150 other spectators. Wenger must have been impressed with the creative central midfielder, because he immediately looked into making the acquisition. Twenty-two might seem a little old to make the jump to the pinnacle of football but this bears the hallmarks of Wenger’s personal playing career. A veteran of the depths of the French amateur leagues, he had the potential to attain greater success but late development prevented him. Wenger only made the step up to Ligue 1 RC Strasbourg as a youth coach, and was called to play in the 1978/79 title winning side only because of injury. For £250,000 Alberto should be seen as a cheap gamble, arriving as part of a raft of new an exotic European signings including the much loved Marc Overmars, Emmanuel Petit, Gilles Grimandi, and Luis Boa Morte, now of West Ham. In comparison Overmars cost £7 million, though bear in mind that in today’s transfer market that equates to something like £23.6 million (Transfer Price Index). Work out the Méndez value and it comes to something like £844,000 in today’s figures, hardly the sort of sum you would expect Man City to be throwing about. Indeed, Alberto made a respectable start, scoring on his debut in a 4-1 triumph against Birmingham City in the League Cup in October 1997, at Highbury as part of a team of young Arsenal players, typical of Wenger’s policy. 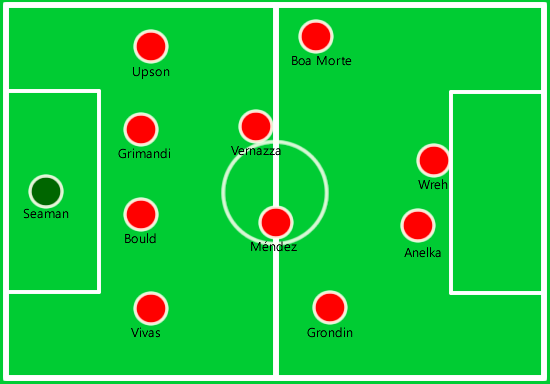 After going 1-0 down Boa Morte scored two, Platt knocked one in, while Boa Morte set up Méndez for the fourth both sides ending on 10 men after extra time. Interestingly Wenger opted for a slightly modified 3-5-2, with Méndez playing just off the striker, interchanging with Hughes. 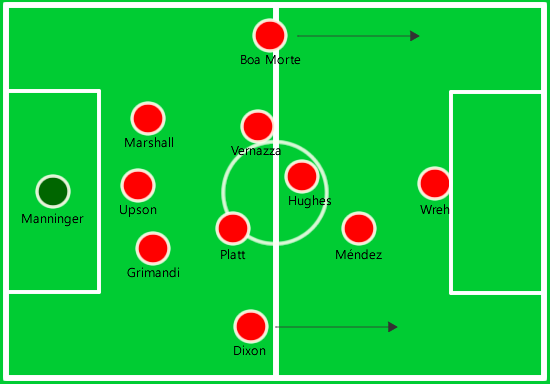 Familiar names such as Grimandi, Platt, Dixon, Vernazza and Manninger played in the Arsenal squad that evening, whilst Steve Bruce was in defence for the Birmingham side. It is fascinating to think about the changes in each one’s career since. Alberto went on to make a handful of league appearances in midfield during that Double winning season. The experience of playing in that side must have felt like a dream world. Rubbing shoulders with world champions to be, Vieira and Petit, must have been something of a culture shock after the days at SC Feucht. In 1998, Méndez got his chance on Europe’s greatest stage, in a dead rubber Champions League game against Panathinaikos in December. The final group game was away in Athens, but Arsenal had already been knocked out of the competition, so Wenger fielded a weakened side against the Greeks. Méndez opened the scoring with a freekick which took a deflection off the former Derby midfielder, Aljosa Asanovic, ricocheting into the corner of the net. Méndez and Boa Morte combined well, both scoring, as well as a certain Nicolas Anelka, another Wenger bargain, Against the odds they won 3-1, no mean feat considering the team selection. So Alberto’s name goes into the history books as having scored one goal in the 1998/99 Champions League, alongside the likes of Luis Figo and Ronaldo. The Greek capital was a place Méndez came to know well as struggling to get first team football, he was loaned out to AEK Athens in February 1999 and then to SpVgg Unterhaching for their Bundesliga adventure in 1999-2000, but played just 6 games in the German top flight. Returning from Unterhaching Méndez realised that his time at Arsenal would be the exception in his career, the sparkling facilities and sell out games would not feature so prominently. He played for the reserve team that year, and slowly the dreams faded. When asked “What are you,” he replied, “Student”, no-one would believe the truth he thought. His final season at Arsenal saw him loaned to Racing Ferrol in the Spanish Segunda División, and in the summer of 2002 he was released, along with a certain Rohan Ricketts, who went to Tottenham. After 11 appearances, only four of which came in the league, and 2 goals it was time to find a new club. The only offers were from Genk, a Belgian first division club and Ferrol, in the Spanish second. He took the Spanish option. Choosing to fight relegation with the club in 2002-03, he clocked up over 2000 minutes of football, starting 29 games. The benefits were personal, instead of being nobody, he was suddenly enthusiastically heralded as one of the club’s best players, but continued to struggle with injuries. The relegation battle was desperate at times. At the director’s behest the whole side went on pilgrimage to the statue of the Virgin of Chamorro, in the Holy City to ask for help, but to no avail. Ferrol ended the season relegated from the Segunda División. Like a true journeyman Méndez moved on to another Segunda División side, Terrassa, neighbours to giants Barcelona. Sadly they were also relegated at the end of his first season. This was a pattern which would become familiar throughout his career. All things return from whence they came, and stuck with few options in Spain Alberto continued his footballing odyssey, joining the very club Wenger had watched him play for eight years before; SC Feucht. From here on Méndez became an almost ever-present in the fourth tier of German football, the Regionalliga Süd (third tier prior to 2008). The instability of clubs at this level saw the now aging playmaker switch teams almost every year. Feucht were relegated to the Oberliga Bayern (fourth tier at that time) at the end of his first season in 2005, and he moved to a newly promoted Regionalliga club SpVgg Bayreuth for 2005-06. However, Bayreuth were refused a licence for the following season 2006-07, resulting in a second successive relegation to the Oberliga for Méndez. The sorry story continues as Méndez joined Regionalliga side SV Darmstadt 98 for one season, only to find them relegated in 2007. The change came at SV Sandhausen, joining up with the team for 2007-08 the side Méndez finished 5th in the Regionalliga, allowing the team to enter the newly formed 3. Liga, Germany’s third tier (since 2008), where giants such as FC Heidenheim lurk among other big names. Scaling these heights was too much for the midfielder, and he only completed two games in the 2008-09 3. Liga before injury overtook him. In the January window 2009 he joined SpVgg Weiden, dropping two divisions, but didn’t play due to his injuries. The team were promoted into the Regionalliga Süd for 2009/2010, and Méndez found himself yet again in the fourth tier of Germany’s pyramid. Last season he played 26 matches and scored 7 goals, a key player for the side, albeit an aging one at 35. 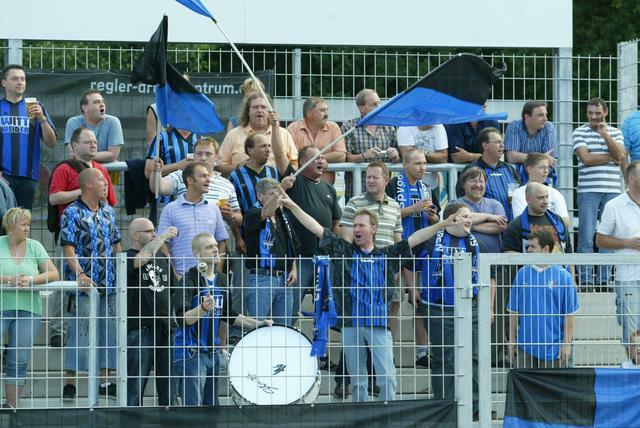 The Blue and Blacks of Weiden out in force. 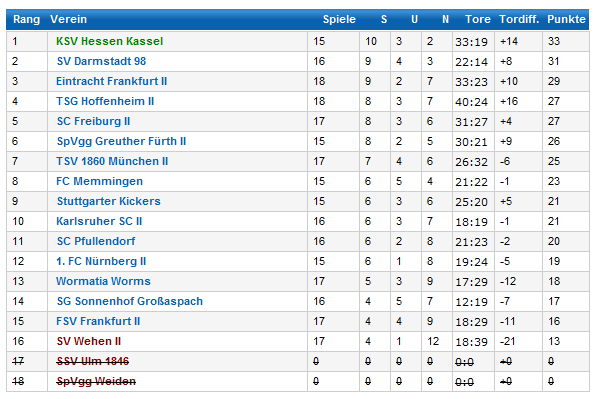 Just another day in the Regionalliga Süd. The highlight of the season must surely have been a home tie at the Wasserwerk Stadium in the DBF Pokal against Jürgen Klopp’s Dortmund, though the team lost 3-1. Méndez though finally got his name on the scoresheet against a Bundesliga club. Méndez, one of the most skillful players in the Regionalliga, would have been suspended for the Dortmund game for a red card in an earlier match, but after a successful appeal Weiden managed to get his name on the team sheet. The mystery deepens as we come to this season though. There are no appearances listed for Méndez whatsoever. In fact there are none listed for any of the Weiden players. After digging through the finest German literature on the amateur game it became apparent that this season Weiden were removed from the division until further notice due to debts of over 1 million Euros. Here was the explanation for the lack of games, and missing scores. Weiden are in limbo, looking to raise funds for a successor club whilst negotiating some kind of settlement regarding their league status. But what of Méndez? Surely such a journeyman of the Regionalliga knows these situations well. A journeyman moves on, just as Alberto has done every season since reappearing in the German game in 2004. After six relegations in eight years something was different this time around. The fact that his face is conspicuously missing from the Weiden team photo this season, brings the faintest scent of change. Little is written about the German fourth divisions, and news is hard to come by for foreigners. Delving into the archives of German newspapers, the truth comes to light. Alberto has already retired, and not through his own volition. In November 2010 the 36 year old suffered a serious injury, and decided to call time on his career, just as his club went out of business. His ‘participation’ was over. As a Wenger signing he will always have notoriety as a player who failed; listed as a ‘transfer flop’. Behind the gaudy headlines and cheap articles is the story of a real footballer, one who was plucked from obscurity, and lived the dream of every ‘good’ player who was never quite good enough. Méndez found his level in Germany, and the 113 appearances he went on to make in the Regionalliga Süd belies his value to those teams. A true journeyman midfielder whose story is repeated ad infinitum throughout the football world. How many of Arsène’s current crop will follow a similar path remains to be seen. Excellent piece – always nice to know where people went with their careers. Brilliantly written, too. I very much enjoyed reading your article, you clearly worked quite hard to find some of those stats, thank you. I remember as youngun having a poster of him on my wall which i got from the old Gunners magazine. more of the same please!!! fantastic work yet again. Yes, I’m quite sad we couldn’t have had a piece on it in November for him. But in any case this is his tribute. No-one else seems to know from what I read. What a great blast from the past! Mendez is a proof that Wenger has bought a lot of cack over the years, even though he has bought many world class players too. What a fantastic article. I really enjoyed that. More please! Kind words, very encouraging. As long as the ideas keep coming I’ll keep writing these things. Here’s to Alberto. Ah yes, Christopher Wreh – that would be an excellent one. Thanks Mike. Gadget – I followed your recommendation from ACLF. Worth the journey. Too bad many of the would-be managers in the blogsphere think football management in general and player signings in particular is like moving a few pieces on the chess board without an opponent on the other side. Nothing is certain in this life especially the fortunes of human beings. Thank gawd we have a wise man at the helm of our club who does not treat the David Mendez’s of this world as a disposable asset to chewed up and spit out at the drop of a hat. Appreciate the comments – I think that Wenger definitely places emphasis on pastoral care, and well being for the player. He attempts to set them up for life. Alberto got his chance, but after Arsenal he still had a career of sorts. I’m always happy to write pieces people enjoy reading. It’s what makes it worthwhile. Currently developing some more ideas for the coming weeks, needs thought though. An exceptional piece of writing, offering a rare glimpse into the lives of our unheralded, former players. Often, us fans forget, behind a footballing name is a real-life human. With a story of triumph and adversity. Thanks, once again blog author, for drawing our attention to these individuals. Hello, I am that individual you name blog author. I’m sure that the story written here has been repeated thousands of times in myriad ways over the years. Just look at those young players listed in the line-ups for Panathinaikos and Birmingham. So many never continued at the top level. Excellent username by the way. And sorry about it, it’s really terrible play with words but I’ve stuck with it for many many years now. It originated from when I worked in the Finnish music business, and we’re famous for the run of zero points in the (rather pathetic) Eurovision Song Contest. Wow. Sorry I can’t add much to the superlatives above. That’s the kind of a feature article you would expect from a top-end magazine. If you’re not yet earning a living from journalism, you now have some excellent references to show for. FYI, I think I got here from desigunner’s blog (or possibly ACLF) as I’ve limited myself to only three Arsenal blogs. High compliments, it’s good to hear – glad you enjoyed Alberto’s story. I’m not earning a living from journalism, though it would be a career I’d love. I’m of the opinion that there’s no point reading articles I wouldn’t enjoy reading myself. Limiting yourself to a select few websites is well worth doing my Finnish friend. 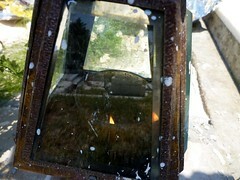 There is an awful lot of dross out there, not all from blogs either, though I would say this one probably used to be. Putting the effort in now to write the best articles I can. The best writing I’ve seen on a blog (football or otherwise) in a long time! You have real talent.